This is not the first Lao restaurant in Ha Noi. This is not a restaurant located in a prime location in the capital city. This is Melao Restaurant, whose name means falling in love with Lao cuisine and can be found at 296 Le Trong Tan Street, Thanh Xuan District, Ha Noi. For many diners, the restaurant holds special memories when it comes to the cuisine of the kingdom of frangipani flowers. 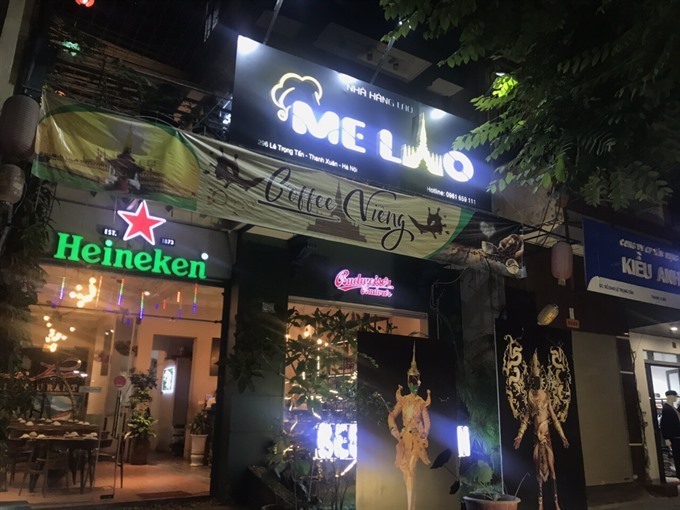 Melao Restaurant stands out on a large two-way street, attracting passers-by with its eye-catching outdoor decor featuring the image of Pha That Luang, a large, gold-covered Buddhist stupa that can be found in the centre of Vientiane. The indoor space creates a cozy feeling with warm lighting and simple tables. Pictures and images of Laos adorn the walls, along with the national flags of Viet Nam and Laos. 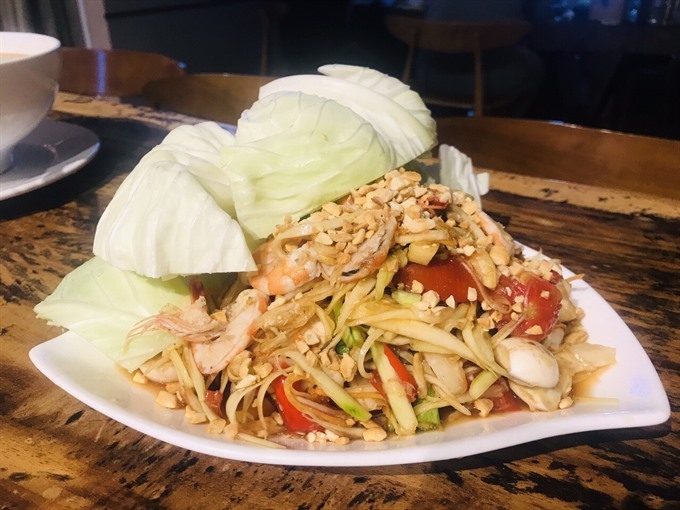 The staff are young, well-mannered and knowledgeable enough to provide diners with an overview of Lao food. Specialty: Larb is a favourite Lao food. 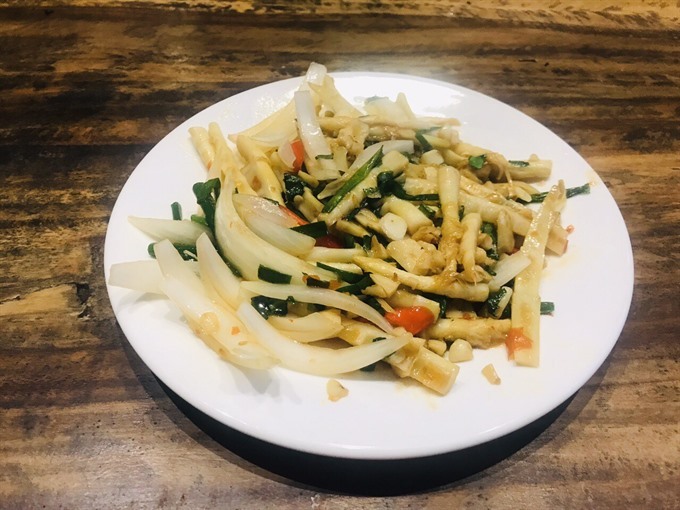 Basically, Lao cuisine has many things in common with that of the Thai ethnic group in the Northwestern region of Viet Nam, but carries some distinctions in terms of spices and flavours. A typical Lao full course has cereal, meat, alcohol and fruit. Laos, being landlocked, does not feature seafood in its cuisine. However, it can bring the best of the mountains to your table. The cooking style is quite simple, i.e. grilling and steaming. You’ll notice that Lao chefs really love putting chili in their dishes. 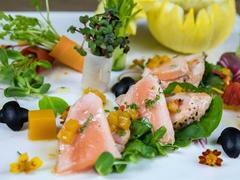 The hot taste of the food makes for a different culinary culture. Why? Remember that Lao people often do manual work; eating chili helps enhance the appetite and boost the digestive system, so they can eat more and have more energy to work. Vietnamese diners, especially those from the North who are acquainted with mild tastes, are advised to ask the cooks to reduce the amount of chili. When it comes to the appetizers, I cannot forget to mention larb which means “luck” in the Lao language. Larb is popular across the country and represents wishes of good luck from host to guest. 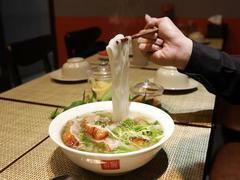 The main ingredients for the dish are either beef, pork or chicken. The cooks also mix ground liver with spices, lime, chili, galingale and roasted rice powder. The larb is then served with fresh vegetables such as lettuce, cowpea and crispy eggplants, creating a heart-melting smell. The sour taste of lime, the hot taste of chili, the aroma of spices wins the hearts of any demanding diners. Another well-known appetizer, tam maak hung, is basically papaya salad. However, Lao people prefer papaya which is not too young or ripe. The papaya is sliced and seasoned with lime, fish sauce, eggplant, pepper and chili. As you may know, papaya salad is an indispensable part of Lao meals. If Vietnamese people often make dry salad, Lao people are fond of a wetter option. The reason is that they can make use of the sauce from the salad for another side dish. One more difference is that the salad is served with cabbage leaves to make the taste stand out. Because people live on the mountains and near lots of rivers and lakes, a large part of the cuisine comes from freshwater fish, poultry and cattle. The steamed sticky rice from Laos is especially delicious in terms of texture, flavour and aroma. It is commonly served with Lao sausage, smoked buffalo, stir-fried chicken with Lao lime leaves and steamed fish with special herbs. Steamed sticky rice and dry food can fill up diners quickly, but the texture of the rice and various herbs ease the problem, so diners can eat as much as they want. 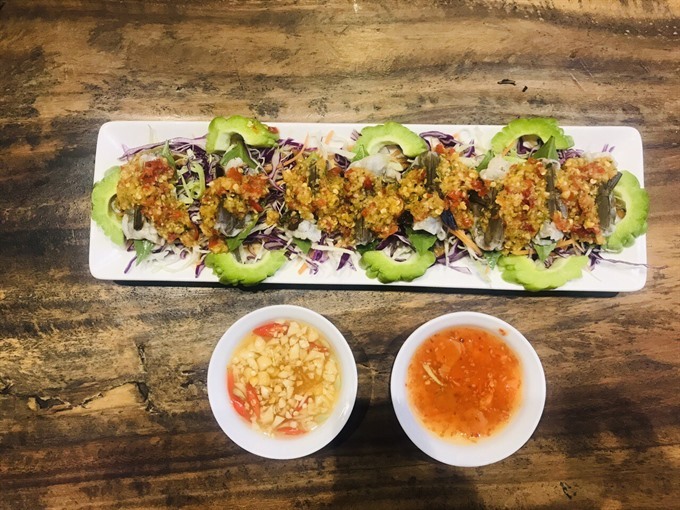 Melao Restaurant imports fresh materials and original ingredients from Laos, ensuring the authenticity of the dishes. This may mean that Melao is taking a risk by not catering for Vietnamese tastes, but for gourmands Melao is still the first choice for the original taste of the Kingdom of Frangipani flowers. That’s why two years since its establishment, the restaurant manages to stand out in the industry despite other famous Lao restaurants. Melao also offers a set menu for groups, such as the Luang Prabang set for four or five at VND468,000, the That Luang set at VND780,000 for six, or the Million Elephants set at VND1,270,000 for eight. 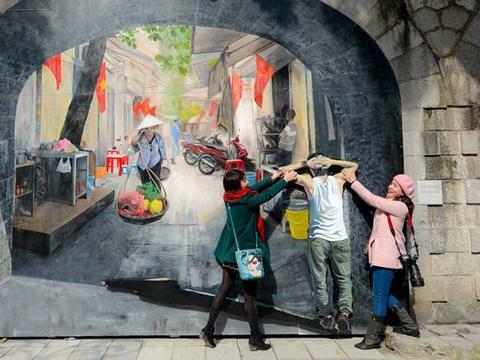 Address: 296 Le Trong Tan, Thanh Xuan, Ha Noi.